William Barron & Son offered work to local people in the first half of the 20th century and in 2013, Derbyshire County Council honoured Barron’s Borrowash house with a blue plaque as a permanent and visible memorial of its former owner. Barron died in 1891; but the most famous Borrowash gardener has not been the only man in the village to turn the gift of green fingers into money! The first 25 years of Geoff Oakey’s working life were spent at sea. 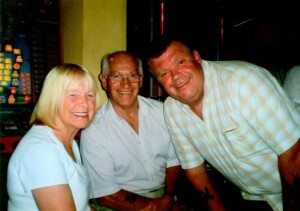 Since 2000, Geoff from Draycott Road who served 25 years in the Royal Navy has made his living from the land. I started a gardening business in October 200 – probably not the best time to set one up just before winter, because I was living off fresh air until spring! But then the business absolutely took off! I started out with half a dozen of my friends and before I knew it, I was absolutely snowed out with work! I’ve had forty gardens every week ever since. 113 years after the death of William Barron, in an age when Facebook, Twitter and Google reign supreme; a way with a garden is still a thriving business for a resident of Borrowash. He was not born there. I was born in Preston in 1958 and by the time I was five we had moved down here to the area, first to Sawley, then to Chilwell, Beeston. He was on the Ark Royal that was built in Cammel Lairds in the middle 50s one of the earliest members to join when it was being built. And my mother was a pen-pal from Preston. On a Friday night, she used to work with her mother, cleaning offices. And my Dad used to go to Preston and end up spending Friday night cleaning offices with my mother, so that’s how they got together. Every nice girl loves a sailor, and Eileen and George married in 1956. About a year later, he left the Navy and became a postman in Preston. Then he got transferred to the Nottingham Sorting Office. That’s why we ended up down here. The family moved in ’62, ’63, but although you can take the girl out of Preston, you can’t take Preston out of the girl as the adult Geoff would find. Dad will bring her up for a night match and drop her off here at half past three and then I drop her off home. All the supporters we sit with; all the other season ticket holders are always threatening to get us some sort of recognition. Even the Preston padre shakes our hand every home game — everybody we know up there says we ought to get a medal for actually doing what we do. We leave here at 10.30 on a Saturday morning and we get home at seven on a Saturday night. And my mother leaves home at nine o’clock and gets home at seven. And she was 79 in July! Back in 1963, five year old Geoff started school at Mikado in Sawley. It’s not there anymore, but it used to be behind the chippy, opposite the church. And from there I went to Brooklands – that’s not there either. The Oakey family then moved to Beeston and Geoff, who did not sit the 11 plus examination, transferred to Beeston Fields County Secondary Modern which was a horrible school – all boys. Schooldays were not the happiest of his life, but choosing a career was straightforward; he would follow in his father’s footsteps. I left school in May ’74 and I joined up on the 25th June. I knew before I took my exams that year that I was already in. I knew from the February that I was joining the Navy. 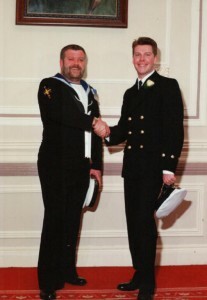 It was a decision that would see him rise to the rank of Petty Officer Weapons Electrical Mechanic, having taken part in everything that occurred in the Royal Navy’s history from 1974 till 2000, including the Cod War, a spell on a Green Goddess, the Falklands War and involvement in the first Gulf War. I spent my 18th birthday doing nine two week patrols being rammed by gunboats and protecting trawlers. It was an eventful and, as it turned out, typical, introduction to life at sea. The Cod War was a confrontation between the United Kingdom and Iceland over fishing rights in the North Atlantic. There had been disputes in the 1950s, and in 1972, Iceland threw down the gauntlet with a unilateral declaration of an Exclusive Economic Zone (EEZ) extending beyond its own territorial waters. It then announced plans to reduce over-fishing and policed a quota system with the Icelandic Coast Guard, leading to a series of aggressive net-cutting incidents with British trawlers fishing in the areas. Retaliation was certain and the Royal Navy upped the ante by deploying warships and tugboats as deterrents against future harassment of British fishing crews by the Icelandic craft. As a result, direct confrontation ensued with a number of ramming incidents between British warships and Icelandic patrol vessels. Geoff Oakey found himself in the thick of the action, despite having a less than secure understanding of the issue. It started kicking off on the news. I was only 17 at the time and I was on my first ship. I’d only just joined HMS Juno and then this Fishery Protection thing all kicked off and they started cutting the warps of the trawlers. That’s when the British warships got involved and I remember going up there because it was nine weeks after my 18th birthday before I had my first legal pint! Each patrol was nine weeks. When it got rough up there, all the gun boats used to wobble off back to Iceland and then we’d be sat in 120 foot waves, waiting for them to come back again. Geoff and his crew were entrusted with protecting the UK fishing fleet by taking up position between the nets and the gun boats. They put their cutting gear over the side and tried to cut the warps of the nets and we’d get in between. The problem was, these things had got six foot thick concrete bows because they were ice breakers and we had three eighths of an inch plate! So it was like opening a tin of beans! We came back with, at the time, £350,000 worth of damage. The bow just sliced the crane off the back of the ship! As it rode up on the quarter deck, it just peeled it all off us! One of the funniest things – it was really rough and my friend saw this massive sponge pudding, sliding across the serving hatch, and he got up as it slid across the hatch and dived, full length; caught the sponge pudding and before he managed to hit the floor, he’d put it above his head and he took the full fall on his nose! Not a crumb came off the pudding! But he broke his nose! A cheer went up because he’d saved the pudding! It was really funny! And – there wasn’t much left to eat after he’d peeled the blood off it! There were a lot of really old hands down my mess deck- three badge men. People who were Able Seaman rank, but had been in for 20 years. He describes his experience as a real learning curve but recalls a sense of camaraderie and family involvement that must have been important in building loyalty and commitment to the service. My parents and sisters and brother came down to Plymouth or Portsmouth and stayed in a hotel – we’d set sail at eight o’clock in the morning with 400 families! There’d be two or three ships all doing the same. We’d do refuelling; we’d do shooting; we’d have the helicopter flying around – it was Families Day at sea! Well, things like that, they can’t afford them anymore. And there used to be the biggest buffet – salmon and all this malarkey. It used to be fantastic! But it hasn’t happened for years. You didn’t go to the Captain or First Lieutenant. If you did something wrong, it was dealt with ‘in house’ and now you can’t do that, because it’s called ‘bullying’ or ‘victimisation’ or something. Towards the end of my career, you’d think, ‘He needs to go behind the lockers for a good hiding’. No. You’ve no chance. You’d be up for ABH or whatever! But I accepted it as part of the learning curve. I’ve been in a few John Wayne Specials! Once we had a 200 man a side fight in Casablanca; chairs and all sorts, but there were no weapons involved. It was a proper man’s fight. Nowadays, for all your liberal ‘do-gooders’ nobody’s got any backbone. That’s why they get knifed and shot, because they’re not man enough to stand up and front it out, which makes me wild, really. After a metaphorical baptism of fire in the Cod War, Geoff switched to the real thing, spendingnine weeks on a Green Goddess based in RAF Manston in Kent. 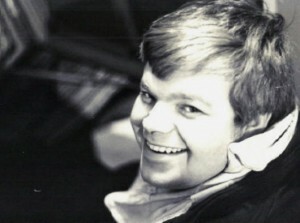 He had been promoted to the post of Leading Hand and would later take leadership and electronics courses at Collingwood. As Leading Hand, he was one of a six strong Green Goddess crew. Despite working in Kent, the team base was a barracks in Harrogate to avoid exacerbating already fractious relationships between professional firemen and service personnel. One of the biggest fires broke out in an upper story at a primary school that had been attended by former Tory Prime Minister, Ted Heath. Addressing the crisis was difficult because unlike regular firemen, the Goddess crew had no ladders and struggled upstairs fighting fire from the bottom. during the process, Geoff acquired a nickname. An officer turned up – Lieutenant Commander – and we had a little skinny Steward, he must have been only about seven stone and he was wet through. The Commander said ‘Right, well, we’d better get these floorboards up.’ So this lad picked up the axe – it was a double-blade and something a lumberjack would have been so proud of – and he staggered when he picked it up, never mind swinging it over his head! Anyway, I stood with my legs apart, I got this blinking axe and I was going full tilt; clearing three floorboards at a time. And this Lieutenant Commander was standing on my left, about two and a half yards away. Well, I hit the cross beam, didn’t I? I came down with the axe and it spun right out of my hand – just went – and it shot toward the Lieutenant Commander and it went through the crease on his uniform! Two more inches and it would have sliced his leg off, just below the knee. Well, everybody after that started calling me the Axe Man. He inscribed it on his helmet. The work was extremely challenging, and the crew learnt how to do the job by actually doing it after the briefest of training regimes; a 24 hour fire fighting course at Chatham. The worst one I had was in a barn. There were four dead horses in this barn and it was full of hay; it took us hours and hours and it was really smelly, with burnt horse and burnt flesh. We were there all night doing that one. Riding on a Green Goddess, flying past, bell ringing, foot to the floor, charging across roundabouts (we went straight through the flower beds, straight across the other side)was the biggest adrenaline rush for crew members. Well, we’re going down the road, just tootling along, and I saw this bloke looking at us. And he was in a Triumph Herald, and his head turned, following us – and he went straight through a shop window! He just kind of veered into a shop, so we had to stop and pull him out. He was mesmerised! People were. She came running out this woman, because the carpet was lifting off the floor in her back room; we hadn’t got the fire out because we were pouring water down the wrong hole! You know, she wasn’t best pleased about that! But there were many grateful beneficiaries of the ‘gung ho’ Green Goddesses. One Christmas, Geoff’s team enjoyed hospitality, courtesy of the largest hotel in Margate, although another crew had extinguished the fire in question. We were the only ones who could actually go. So we all went up on stage, all six of us; we were in civvies – we’d put a pair of trousers and a shirt on – it’s Christmas Day, so we did get scrubbed up a bit. It was all big collars and that kind of malarkey. It was in the ‘70s so we had flares and big boots – we looked like those Status Quo types. The compere introduced the crew to the audience; suggested that the Green Goddess heroes might appreciate a drink in return for their bravery and then Christmas began in style! I sat there with two pints of bitter on top and three underneath and as fast as I could drink it, it was just getting replaced! And we were there until 10 o’clock that night! We had Christmas dinner – and the buffet at tea time – never spent a penny! It was one of the best days of my life! And I’d nothing to do with putting the fire out – none of us did. What a day! Christmas 1977! On Friday, April 2nd 1982, Argentine forces invaded and occupied the Falkland Islands and South Georgia. The Islands, situated east of Argentina in the South Atlantic had been the subject of a prolonged wrangle over sovereignty between Argentina and the United Kingdom, dating back to the 19thcentury. There was no scope for compromise. Argentina regarded their original invasion as a justified reclamation of Argentinian territory, whereas the Thatcher government considered that a British dependent territory had been invaded. 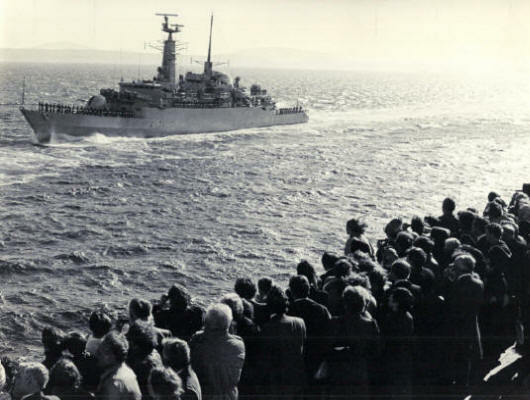 Neither state officially declared war, but the conflict, which lasted for 74 days and claimed the lives of 649 Argentine military personnel, 255 British military personnel and 3 Falkland Islanders, ending in British recapture of the Falkland Islands on 14th June 1982 – was a war in all but name. Once again, Geoff Oakey was in the eye of the storm. When you’re on board ship and you’re going into a war zone, you do a thing called defence watches. In the morning, you have your breakfast; you go on shift and you’re on until midnight. Out of any 24 hour period, you’re six on, six off. You do that for a couple of weeks. The only time you know what time of day it is, would be if there’s bacon. If there’s bacon, you know it’s six in the morning. Other than that, you haven’t got a clue, especially down somewhere like the Falklands because half the time it was dark. I did defence watches for five months, and in that period, apart from toiletries, I just saved everything I earned. I banked it all. To be honest, that’s how I bought the house. I’d go for something to eat and then go down the mess and the next thing you know, we’ve come under attack! So you miss your six hours off and then it all cools down and it’s back to the defence watch shift. You can do eighteen hours non – stop like that. I went at times, two or three weeks without a shower. You couldn’t take the risk because it could all kick off! If you went overboard, you’d have only a couple of minutes in the water , but you had to have layers on before you got into your once-only suit, which was a big plastic thing that you put on. The ship was kept cold with no steam heating on so that if you went over the side, everyone was fully clothed with the right kit. You weren’t there in a pair of shorts thinking ’Oooh, abandon ship!’ and you’ve got a pair of shorts on and flip flops! You had your overalls. You slept in your boots and you had your woolly socks on. In such fluctuating and unpredictable circumstances, observing the correct drill was essential. Once I was running up a ladder and the pipe came over ‘Take Cover! Take Cover!’– you had to lie on the floor with one hand under your chin and one hand on top of your head with your mouth open. You know, I’m lying there when they pipe up ‘Take Cover! And I hit the deck and the whole ship bounced as we got straddled. One bomb port side; one bomb starboard side – nothing in the middle! And we just jumped up – jumped up and the whole ship shook and kind of lifted out of the water as the bombs dropped either side of us. And then you were back on your feet and running to get to your action stations. It was fine if I was awake, but if you’ve gone eighteen hours with no sleep and you’ve just been asleep for two hours then suddenly you’re woken to the sound of bombs – then forget about action stations, it’s panic stations! You’re legging it and then you know, there’s 100 other blokes doing the same thing! There’s 100 blokes already at action stations and then there’s another 100 trying to get to actions stations before it all kicks off. Normally you get plenty of warning, but sometimes, it just didn’t happen. You’d be cruising in defence watches and then something could just come at you out of the blue! Geoff’s period of service touched some of the key moments of the Falklands conflict; such as the attack on HMS Glamorgan on 12th June, 1982. I heard it coming, because it was fired from the shore side. And there was a big arc that you weren’t allowed to go into, because they knew the Exocet was there. The Glamorgan took an Exocet right up the stern. It went straight into the hangar and killed 14. I was just putting the sheaths back over the missiles – the protective sheaths. I was actually on the hangar roof, putting the sheaths back on our missiles when I saw it and heard it and then I ran back into the Control Room and got on my headset and shouted to the Ops Room that Glamorgan had just taken an Exocet up the stern. So, to be honest, if it had been us, I’d have been off the top, me! I was actually stood on the hangar roof on board our ship which is where the missile launcher was. So I’d have been dead meat then, if it had been us. The Plymouth and the Coventry. I saw the Plymouth with her damage – and then the Ardent and the Antelope when they were sunk. We were sister ships. I lost some friends out there. At other times, the unchanging routine was tedious; manning weapons 24 hours a day the whole length of the time. Six hours on, six hours off, seven days a week for five months. Me and my oppo, we had a cribbage tournament and by the end of it, we’d both won nearly 400 games each! It lasted five months, the cribbage! There were no mobile phones or video links and all that malarkey and a highlight was the ‘trip film’. You went down the mess and you always have a film which is ‘the trip film’. And it was Highlander – and I must have seen it 40 times. Somebody would say ‘Put the film on!’ And everybody knew which film they meant: Highlander! I must have seen it 40 timers. Living conditions, cosy at best, resembled the quarters of a battery hen. On a Type 21, there are about 170 people and our mess deck was 44. That’s 44 blokes living in one room. You couldn’t all sit down at the same time and the beds were four high. You had little gulches off the mess square and there were eleven gulches with four beds in each, so you slept four high. The ceiling was only seven foot tall and there were four beds, one on top of the other. Geoff found that it was possible to read by bunk light if he lay on his side, but reading on his back with the book on his chest was out of the question, because there wasn’t enough room between the bed above me. But the living and working conditions and common aim forged a unity between the men because as a general rule: the worse the trip, the closer the ship’s company becomes. And it was unbelievable when we got back. There were literally thousands and thousands of people on Plymouth Ho! And banners and – yes it was absolutely marvellous – spectacular, coming back! I was there the day after the big hurricane hit Montserrat and I spent ten days flying ashore in the helicopter; we all did. I spent ten days rewiring incubators at the hospital. We did a lot of disaster relief out there – that was something that I was quite proud of, helping them there. 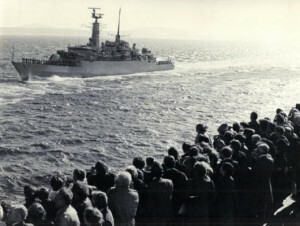 In 1992, he returned to the Falklands, on board HMS Arrow. I did a couple of the War Walks when Colonel H was killed. It was really interesting. We started off at the start of the battle and they walk you through the battle, actually where it happened. – and there’s a marker for Colonel H.
It turned out that the night he was killed, the ship that was providing gun support was HMS Arrow. That was the ship that I was on — that all of us who did the War Walk were on. It was quite fitting, really. I got immense satisfaction out of knowing that my radar had done the job. I could track an aircraft from 22 miles away and then launch a missile and hit it. Same as with the gun; shore bombardment. I wouldn’t get Electronic Monthly, and I’ve no interest in new gadgets. I always liked gardening anyway, but for the past thirteen years, I’ve been really happy. 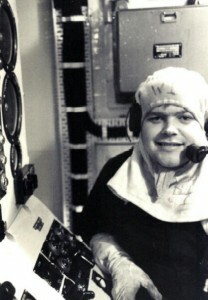 In the Navy for the first 15 years, I was obeying orders. For the last 10, I was giving the orders. Now, I just come out and work on my own. I go out and I enjoy it. I’m out at eight every morning and I come home about half past four. Cutting hedges, painting fences, digging, planting and weeding plots, add up to a very different routine from the life on HMS Active, or fire fighting with a Green Goddess, but the quality required to succeed in both is the same. You need self-discipline to do the job because you’re self employed. But you go and you do a couple of hours. I’ve no mortgage, I’ve no kids, I’ve got no dependents, I’ve got a Navy pension. At sea or on shore, whether doing eight gardens a day, or ferrying Eileen Oakey the length and breadth of the country to support her football team – the discipline learned in the Royal Navy’s school of hard knocks, has served Geoff Oakey well. Hi Geoff, Ginge Cahill here, with you on Juno, I’d reckonise that beaming smile anywhere. I remember the broken nose incident, can you also remember the red jelly flying off its stand and covering Thomo Thompson, from head to toe. The opps room where panicing because they could not raise us, because we where all rolling around the floor laughing at Thomo. first into the capstan, and had his watch ripped off his wrist by the rope, which promptly flew overboard. Who might that guy have been Geoff? I am roaring now just thinking about it. Thank you for taking the time to do the piece, really enjoyed it Mate. Annie Oakley and the famous “Flying Squirrel” display whilst descending 3D mess ladder. Good memories of the Active and the rest of the 21 club. I,ve still got the famous flag at home and sound memories of 82. Would love to catch up some time. Mick (BONES) Procter (Baby stoker). Annie, how you keeping shippers, been a long time. Would love to hear from you. Good to hear you did well and are enjoying life.